A leaf refers to one sheet of paper which may be printed on one or both sides. A page refers to one printed side of a leaf of paper. Thus, each printed side = one page. Each leaf of paper has two potentially printable sides, or two pages, so a stack of ten leaves bound together would create a twenty page booklet. A brochure that is made up of one leaf of paper folded in half, has four potentially printable sides and is thus referred to as a ‘four pager’. If your brochure consists of two sheets of paper folded in half, it has eight potentially printable sides, and so on. 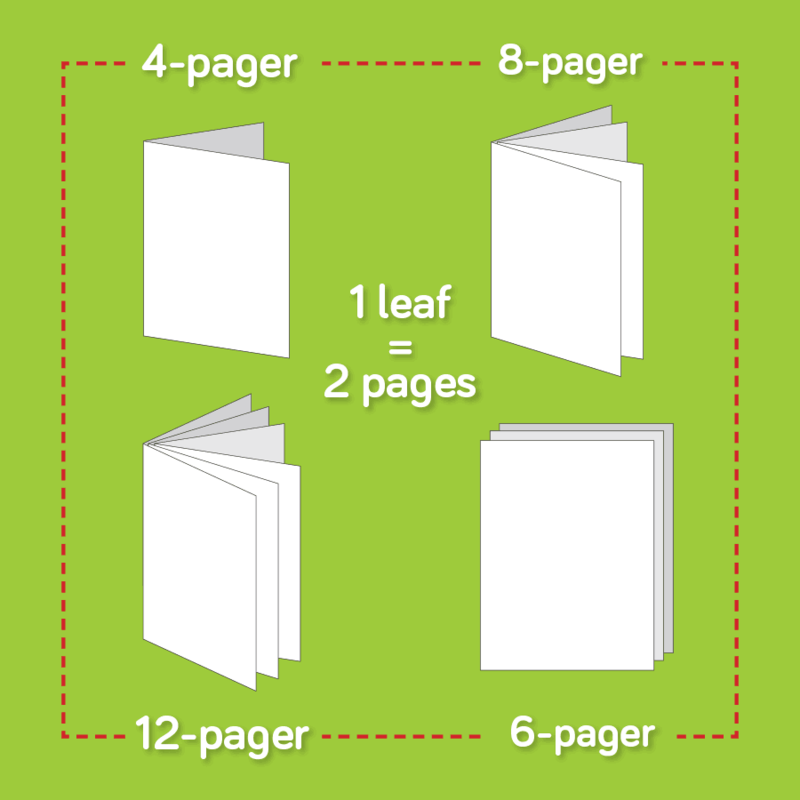 So it follows that if your booklet is made up of folded pages saddle stitched in the middle, your page count must always be a number divisible by four as each folded leaf represents four pages. So if your booklet consists of say four sheets of paper folded in half and stapled, you would land up with a sixteen pager. However, if that same booklet had a cover added to it that was of a heavier grammage than the text pages, we would refer to it as a sixteen page booklet with a four page cover – front cover, inside left and right covers plus a back cover. If you ever get confused you can always refer to our handy illustrated guide above or send us your artwork and we’ll confirm your page count for you!